You all are so great for listening on my last post. I think (hope) we all have those moments of feeling totally overwhelmed at the beginning of the school year, especially when moving rooms or switching grade levels or just starting out- and your comments made me feel better, like I wasn't just being a crazy person! Things are getting better, though, and I'm starting to feel excited about 3rd grade again! I kind of got out of my new teacher series, but I'm hoping there are still a few new teachers that haven't started yet and this might be helpful to. If not, well... there's always next year! Okay, okay, you finally get to think about setting up your classroom. Even before you go in, you can start thinking about what spaces are on your 'need' list, and what spaces you 'want' to have if it works out. As you think about spaces in your room, you need to think about the spaces for LEARNING, the spaces for TEACHING, and the spaces for STUFF! You might not need all of these, but here are some suggestions to get you started. 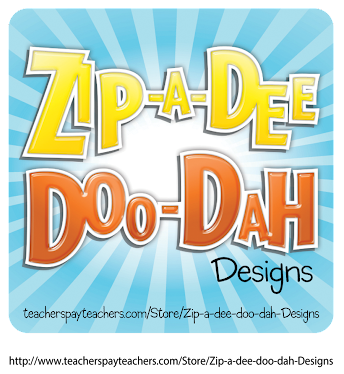 When I say teaching, I'm talking about teacher-directed activities. Of course, students should learn there, too, but the "learning" spaces are for student-directed activities. Storage of notebooks, writing binders, etc. The important thing is to start big, and then think detailed. Once you have a list of the spaces you want and need, it's time to talk to your technology person, if you haven't already. What are the connections that you can't move? For me, my teacher computer had to be in a certain spot so it could connect to the SmartBoard (which had to stay in its certain spot). Not where I wanted my desk, but I like having my computer at my desk, so... I guess that's settled. Then, look at what else can't be moved in the room. If you have bookshelves built in, or a sink area, or coat cabinets, those are going to help determine some spaces right off the bat. When you're thinking about wall spaces, consider which spots are magnetic. This is also a great time to ask your custodian if there is any extra furniture you might be able to snag, so you can take that into account for your planning. Go ahead and sketch out the basic shape of your room with those Can't Move items included. Then, get out some sticky notes and write out the Teaching and Learning Spaces you brainstormed up above. You can cut Post-Its or put two together if you need to drastically adjust their size. From there? Start playing around with the Post-Its. It's much better on your body to move Post-Its 50 times than to move furniture 50 times. I know that I still have to "see" it- but Post-Its help me find a good possibility so I don't have to move it all too many times. 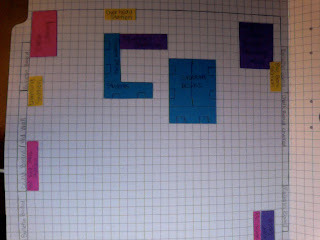 There are computerized ways to make a mock classroom layout, but I like Post-Its. More fun, and no need to worry about wanting something at an angle that a computer won't allow. It's important to think over student teaching as you sketch. What worked for ME in that classroom? What didn't work that I need to do differently? What were struggles I had that I need to plan to avoid? What are some areas where I still need help and can ask someone for a suggestion? This is a good time to think about your desk arrangement, too. Do you have desks or tables, and how do you want them seated? I like to change my set-up throughout the year, but generally, I like groups and my students do, too. Yup, move the actual furniture around. Invite friends and family for this step. Order pizza if needed for bribery. For super-big stuff, like a teacher desk, the custodian sometimes has tools that will help. Please be careful not to scratch the floors or mess up the waxing, because you want the custodial staff happy. Once you have the room tentatively set up, walk around it. Sit down in the student spaces, and see what it's like from a shorter perspective. Sit down in your teacher areas. Make sure that you can see the whole room from your small group area, so you'll be able to supervise all of your students. Make sure you have the wall spaces where you need them. Walk into the room from the hallway and see what you notice. Make adjustments as needed, but hopefully, you've got a basic classroom layout! As you think about the 'stuff' spaces, it's important to think about your procedures. What are the things you want your students to do in the morning, and at the end of the day? Is there a "flow"? I'm trying out an acronym this year to see if it helps my students remember what they need to do, but I also post this as an anchor chart near the door. Click the picture to snag a free copy of my morning procedures anchor chart. If you're looking for more classroom setup tips, I cannot recommend the book Spaces and Places highly enough. The Cornerstone also has some great classroom setup information, both on her website and in the book! Plus, if you haven't already, you have to check out The School Supply Addict's room setup page for inspiration. Have fun setting up your new classroom! 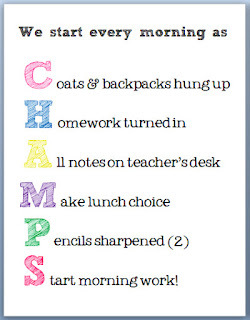 Love your CHAMPS poster. I tried to print it and the H and M would not print out...any ideas? Is there anyway to edit the CHAMPS poster? In my school the kids don't make lunch choices prior to entering the cafeteria. This is great!! Would you consider making a bookmark size of this? Thinking this would be great to put on the desk of my students who need a visual. Thanks! Wonderful ideas! I also love the CHAMPS poster. And having it as bookmarks to be placed on the students' tables would be a cool idea too.